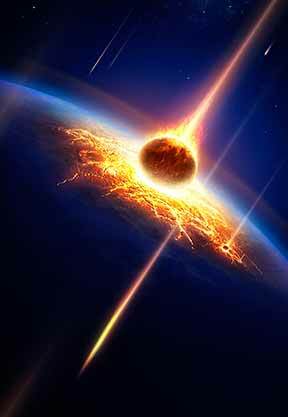 Lists all confirmed meteorite impacts in the world. The museum houses a collection of many of the meteorites found in Wisconsin. Stop by to take a look. A lengthy checklist from the Washington University in St. Louis to help you determine whether you’ve found a meteorite…or something else. Includes helpful photos and explanations. Take this quick quiz from the Arizona State University Center for Meteorite Studies to learn whether your rock is terrestrial or a possible meteorite. An exhaustive but approachable discussion of meteorite science. Covers meteorite discoveries and profiles the individuals involved. —Geology of the Rock Elm Complex, Pierce County, Wisconsin, William S. Cordua and Thomas J. Evans, 2007, Wisconsin Geological and Natural History Survey Open-File Report 2007-02. Includes a photo gallery profiling over a dozen of the world’s largest impact craters. At 50,000 years old, the Barringer crater is still quite fresh, geologically speaking; it shows none of the weathering seen at Rock Elm.